1. The MPOA has received numerous comments from lake users about issues in their trying to cross the sediment pipeline at the designated crossing point. The MPOA continues to work with the dredging contractor to make sure that lake users understand how to cross the pipeline without damaging their boats or the pipeline. 2. To be safe, lake users should at no time come within 100 feet of the pipeline, booster pump, or dredge (except at the designated crossing). The designated boat crossing should be navigated at a “no-wake” speed, using their motor tilt if available. The MPOA has instructed the Wonder Lake Marine Patrol to ticket any lake user operating in an unsafe manner in proximity to any of the dredging infrastructure. 3. The MPOA has also received numerous comments from the dredging crew and other observers of water-skiers coming dangerously close to the dredging equipment. A search for quiet water to water-ski on is not remotely worth the risk of incurring serious injuries. 4. Lake users operating anywhere in South Bay near Highland Shores, Sunrise Ridge, Wonderview and St. Francis Heights will need to remain extremely vigilant of changing conditions. Lake users are again reminded that the intended purpose of this crossing is to allow folks from Highland Shores and Sunrise Ridge to gain access to the main body of the lake. Folk’s from other parts of the lake should be entirely avoiding this part of the lake. 5. The dredge will continue to operate in South Bay for the majority of the Summer 2016 boating season. Once completed with South Bay, the dredging schedule will be updated, as to how and when they will finish Wickline Island, O’Brien Shoals, and West Bay. 6. An inspection of the recent Strom Island plantings was done on Monday, July 11th. Despite the lack of rainfall, the plants seem to be doing well. However, if the dry spell continues, some volunteer help may be needed to help water plants. It was also noted that after the 4th of July holiday, the island was almost completely free of litter, with the exception of a bait container and some incinerated beer cans. If you bring things to the island(s), please take them with you when you leave. 7. The Nippersink Watershed Association has received word from IEPA that the Fed’s have fully authorized the funding for the pending Section 319 grant, which will allow a number of water quality projects beneficial to Wonder Lake to be implemented. I will be setting up meetings with the folks involved with the grant to discuss timing and logistics. 8. The exhibit below shows the approximate location and extent of the sediment pipeline and pipeline crossings for the summer of 2016. 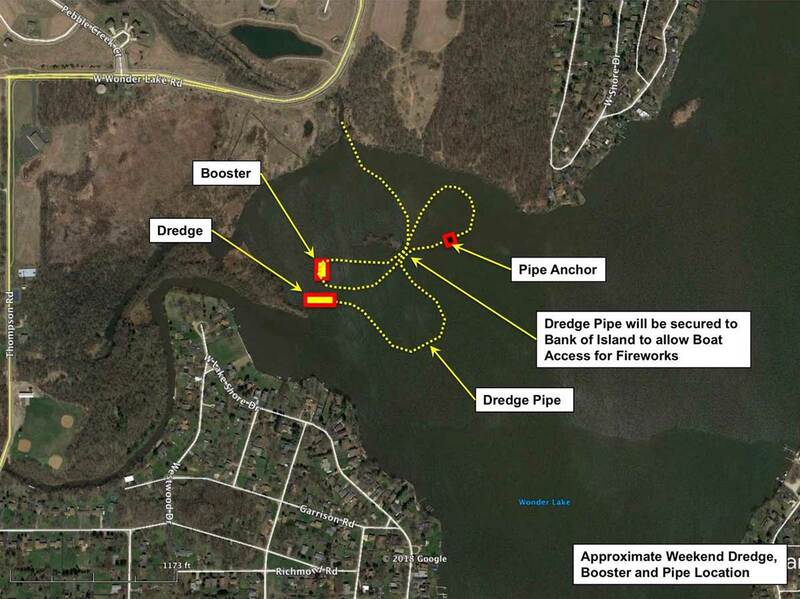 As always, lake user’s need to be aware that the pipeline location and pipeline crossing conditions will frequently shift as dredging progresses.